Square Enix published Dragon Quest IV and Dragon Quest V for the Nintendo DS on their own but they had Nintendo publish Dragon Quest VI and Dragon Quest IX. Apparently Square Enix underestimated demand on Dragon Quest V because it sells for about $55-60. The same thing happened with Super Mario All-Stars, Persona 2, Digital Devil Saga, Shin Megami Nocturne, and Mario Dance Dance Revolution. All of them were eventually reprinted. The price of the game on the resale market is the best indication to a publisher that they didn't make enough and are passing up on some easy money by turning the printing presses back on. I have a new found love for the Dragon Quest series after playing IX (my first Dragon Quest game) and DQVI. 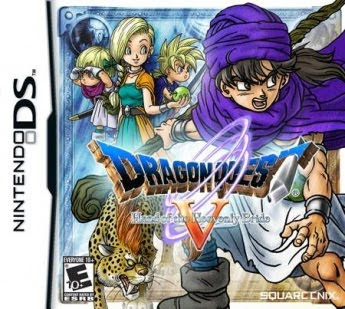 I plan to get Dragon Quest V too, but I think I will be waiting for the inevitable reprint. Can you think of any CD based games where the publisher didn't reprint the title when the resale price was higher than the retail price? If you do you might be able to convince me to pay the extra money to get my Dragon Quest fix. @anonymous - I can see what you are saying but Mario All-Stars was reprinted when Mario Galaxy and New Super Mario were out there. Persona 2 was reprinted when Persona 3 was coming out. Even if you are right though, I think this will be reprinted later in the DS's life when these other titles aren't really selling anymore. Persona 2 was reprinted about nine years after it was released in 2000. I think (rather than printing a new copy). It could become available digitally. I see what you are saying about it being rare and costing more on the secondary market, however the games you mentioned (New Super Mario, Persona 2, and Persona 3) are all disk based games, and I have never heard of a reprint for a DS title this far after release date... There are a few DS games that are still very much in demand and hard/impossible to find at retail (Yoshi's Island, Mario & Luigi Partners in Time, Castlevania Dawn of Sorrow/Portrait of Ruin, Advance Wars : Dual Strike, Kirby Canvas Curse, Animal Crossing: Wild World) I could be wrong, but if you are a betting man.... I'd take that bet. @anonymous - Good point about disc based vs DS games. DS games are something in between CD and Cartridges, not quite either one is my understanding. So they aren't quite as easy to reprint as disc based games but not as expensive as cartridge ones. Clubhouse Games was reprinted by Nintendo. For a while it was selling for $40 but now sells for $5-7. Those games you mentioned might be hard to find at retail but their resale prices are all below the retail price. If they were reprinted they might sell more copies, but the supply and demand is not so out of line that people are willing to pay more than MSRP for it. I will take your bet though. My official bet: Dragon Quest V will be reprinted by December 31, 2012. @anonymous - Thanks for the info. Amazon does say they are temporarily "Out of Stock" and list the price at $39.99. This is a change from before. Maybe you're right and they got wind from Nintendo that there will be a reprinting. We'll have to wait and see. I have put in an order for when it does come back in stock.